Smartwatches and glasses are part of the exciting emerging class of electronics known as wearables, but, as electronics, they still need to be removed from the wearer’s body from time to time for charging. A team of researchers from South Korea set out to create a battery that could be embedded and clothes and solar powers, allowing people to use wearable electronics for long periods of time without the need for recharging. The team says in a Nano Letters paper (subscription required) that their final battery can compete with conventional versions, even after being folded thousands of times. They also say it is inexpensive compared to competing textile batteries. The researchers started with strands of yarn, which they then wrapped in nickel, carbon and other materials that make up a battery. Then they added lightweight solar cells. 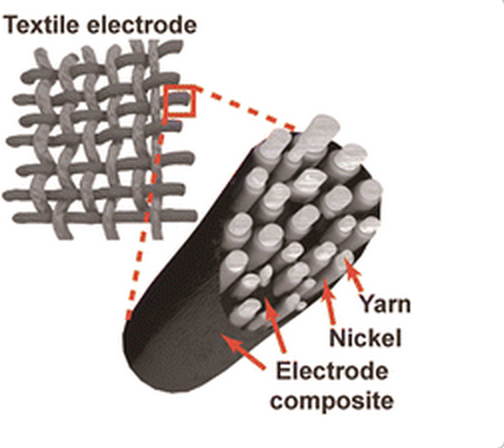 Integrating batteries into fabric could do more than put off or eliminate charging. Wearables, which are built to augment or take over smartphone tasks, generally eat up a lot of power. Engineers have to decide between integrating a bigger battery or sacrificing battery life. Bigger batteries lead to a bulkier look. The Kreyos smartwatch, which some people have criticized for its size. Photo courtesy of Kreyos. The team depicts that their battery can, for example, be woven directly into a watch band. That would reduce the need for bulk behind the watch face. Researcher Jang Wook Choi told Phys.org that the team will now focus on tuning the batteries to better suit commercial applications. They are currently working with companies in related industries to figure out the best applications. Wonder how much a coat could power..